As Park City, and the Wasatch Front in general, continues its ascendancy within the national and international ski culture, the technology, accommodations, and overall experience have become truly world-class. But so have the prices which have consistently crept up over the years—and at a healthy clip. To help combat these rising ski costs, it’s more important and more valuable than ever to do your research on available discounts. Local residents, including those all along the Wasatch Front, will always have a leg up when it comes to finding the best deals, which often require flexibility and pre-planning. Not to mention the ability to visit the resort several times throughout the season and thus take advantage of season tickets and multi-visit package deals. Spending the time to do this research and to sniff around for the best options that fit with your ski habit, well, it can feel like a hassle. Nevertheless, it’s usually with the effort. Whether you’re planning to visit Park City Resort, Deer Valley, or some other fabulous ski resort areas in Utah, you can now get a world-class resort experience, while still doing so at a reasonable price. Without a doubt, the corporatization and consolidation of the ski resort industry has led to major changes—many people would argue both good and bad. One of these big changes has been the ability to buy a pass that is good at multiple resorts and even across state lines. A lot of Coloradoans, for example, come to ski at Park City at least once a year, especially now that the Epic Pass allows them to visit Park City Mountain as well. In truth, this pass includes lift access to resorts across the world including Canada, Australia, and throughout the U.S.
It’s also true that the gap is narrowing between what local residents and out-of-town skiers need to do to get discounted rates on lift tickets especially, but other trip planning costs as well. Perhaps most significantly, new resources are available to help people find quickly find and access these online discounts. Most skiers have heard of Liftopia, for example, but this far from the only way to get online discounts for your ski trip, including lift tickets. We recommend you check out Utah Ski Edge for help planning your next ski trip to Park City, as well as other Utah ski destinations. And these are just a few of the latest developments. There are many resources out there to help you ski more in 2018-19. Do you have your own tip that you’re willing to share with our audience? Do you have concerns or ideas about how to help increase access to Utah skiing in general? Let us know. We’d love to hear them. A little more than a couple weeks ago, the benches and much of the Wasatch Front saw between 10-12 inches of snow. This was great for those, like yours truly, who were looking to get out there and start getting into ski shape by dusting off their skis and gliding over backcountry trails. And sure, it gets us all that much more excited for ski season. But it’s not ski season. It’s still shoulder season and without resorts that are open with running lifts, it makes the full ski experience hard to come by. Aside from one broken bone injury, we didn’t hear about any life-threatening accidents yet this year. And now, as people who live in the mountains know all too well, much of that early season snow is likely to be for naught as a heat wave moves through the area this weekend, bringing 60-degree afternoons here in Park City and 50-degree afternoons in Alta. Along with long-term, seasonal forecasts that seem to predict middle-of-the-road averages, there is definitely an early sense that, for better and for worse, this year could be a volatile one for snow conditions. For the 2018-19 ski season, Park City Mountain (both the main resort and Canyons Village) is scheduled to open on Wednesday, November 21st, 2018 and close for the season on Sunday, April 7th. EPIC Season Passes are already on sale, including EPIC Local and EPIC 4-day passes. The main resort is also advertising a deal where you can get 30% off your lodging costs by booking your stay before November 1st. What’s the Seasonal Weather Forecast for 2018-19? Last year, the Farmer’s Almanac gave false hope by predicting a wetter than average winter for the Intermountain Region. It didn’t exactly turn out that way though. The forecast for the beginning of the ski season is much the same. 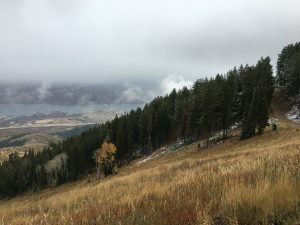 The long-range forecast has a snowstorm predicted for Park City for the end of October/beginning of November, but temperatures are also supposed to stay warm generally in October. The overall winter forecast also suggests slightly warmer than average temperatures with normal precipitation levels. The National Oceanic and Atmospheric Administration (NOAA) is largely in agreement. While there may be slightly more precipitation in the early winter, it could dry out. The NOAA is also predicting a 70 percent chance of El Nino occurring this year. Their maps for the first half and second half of the ski season that we may struggle to keep our snow around in the lower elevations. The takeaway for me is to get up into the mountains as soon and as often as I can. And to hope the seasonal weather forecast is wrong for a second year in a row. I know the snow-making machines have gotten a lot better, but they’re still no substitute….Maybe the only thing more cliché than talking about the weather is talking about how much I can’t wait for the ski season to start. But I don’t care! I want the mountains to be covered with snow, and for ski resorts to open, and I know I’m not the only one. Some of the earliest promotional programs have already expired. Back in May, you could put a $49 down payment toward a discount EPIC pass with the remaining coming due soon as the season is about to begin. Likewise, those who bought daily lift tickets at Park City Mountain Resort in the spring can put these receipts toward a season pass this year. 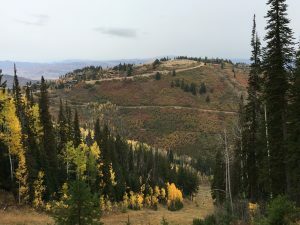 Thus, many people have already purchased their season passes, and you’ll still be able to purchase season passes that deliver unlimited skiing in Park City well into the ski season. But many of the promotional rates are going to expire in October, so if you haven’t bought your season pass, now is definitely the time. We’re all hoping for a great year of snow, but you can’t wait for the weekly weather forecast and expect to get a decent price on lift tickets. Now is the time to commit to how much skiing you want to do this season. We wanted to start with Deer Valley because there’s a new early deadline date for 2018-19 discount season passes. You have to buy tickets by October 15th this year! By far, the biggest difference comes in the Adult Ticket price which jumps between $300-$400 per person depending on how many adults are in your family. There’s between a $100-$200 jump for most of the other season passes. One notable exception? Military servicemembers can buy their season pass for $1,235 at any time. You can find the entire roster of season passes with both sets of prices (for now) here. Owned by Alterra Mountain Company, the Ikon Pass is complimentary with any Adult Deer Valley Season Pass. However, skiers who buy an EPIC Pass for Park City may be interested in buying an Ikon Pass which would allow you to visit Deer Valley a few times a year in addition to scheduling one or more trips to dozens of other destinations that are part of the Ikon Pass resort collective. You can get a $50 discount on the Ikon Pass until October 10th, 2018. Early-bird pricing for EPIC Passes expires on October 7th. Their website simply says that prices will go up. In our experience, this has meant a $50 bump in prices. If you’re looking to travel this year and take advantage of Vail Ski Resorts around the country, you’ll likely be interested in the full EPIC Pass which is currently on sale for $929 per adult and $429 per child (5-12 years). The EPIC Local Pass currently costs $689 for adults 19 and over, $559 for teenagers, and $369 for children (5-12). You can find all EPIC Pass prices and pass details here. The 2000s continued to see growth in both the volume and revenues generated by Park City’s three resorts. What was once a recreational outlet for a mining town became a lifeline boosted by small business investors and was now evolving into a major industry governed by the laws of big business. In 2011, Park City Mountain Resort failed to renew its lease in a timely manner with Talisker Mountain Inc. (which owned and operated the adjacent Canyons Resort). They sent the letter renewing the lease two days late without much thought to the consequence. Indeed, for 8 months, things continued to operate normally until Talisker notified Park City Mountain Resort that the lease had expired. The late notice had given Vail Resorts the opportunity it needed to swoop in. From 2012 to 2014, PCMR sued to retain rights to use the mountain, Talisker sold the rights as well as the legal headaches to Vail Resorts, and in a short-lived standoff, Vail Resorts ended up buying PCMR outright for $182.5 million. In the end, Vail would come to own and combine both resorts and their ski area into one mega ski resort known as Park City Mountain. And so it was that Park City went from three to two ski resorts. Otherwise, the biggest immediate difference for the average skier—both in Utah and Colorado—was the ability to gain access to Park City Mountain with Vail’s popular EPIC ski pass. In 2017, Deer Valley was purchased for an undisclosed amount by an investment group that included Aspen’s parent company but which didn’t even give itself a name until 2018. The newly christened Alterra Mountain Company ended up owning 11 resorts in 7 states including Park City’s Deer Valley, as well as maintaining a close relationship with the ownership of Aspen’s four ski resorts. The larger question remains: The corporate maneuvering aside, what does this all mean for the average skiing enthusiast? Bigger corporate owners mean more investment and more technology and amenities available at Park City’s resorts. Indeed, every few years, the resorts attempt to gin up extra interest by installing new ski areas, terrain parks, and resort amenities. It also means higher retail prices for things like lift tickets and lodging, but it also means more aggressive discounts from these higher retail prices. Huge ski corporations have the resources to deeply research and predict the demand for lift tickets week-to-week and day-to-day. Buying lift tickets at Park City’s resorts is now more like the dynamic pricing of airline tickets than ever before and continues to move in that direction. Likewise, the marketing and advertising campaigns implemented by these corporations have grown more elaborate and narrowcast to specific ski audiences. As three bona fide ski areas took hold in Park City, the final remnants of Park City’s mining operations disappeared for good. At the same time, alpine sports were becoming a major force in competitive sports. The modern cultural trappings of ski resorts came into existence and ski lift technology started to deliver on volume and convenience in a way that could make these ski resorts were profitable than ever. By checking out this archive of ski maps for Park City Mountain Resort, you can get a sense of the extent of the ongoing mountain and ski area development, as well as the ski maps and marketing campaigns produced during these years. A series of notable events further ensconced Park City as a major ski destination. The first FIS World Cup held in Park City happened in 1985. By the early 90s, the three ski resorts were receiving nearly a million visitors each year. In a further sign of the diversification and proliferation of alpine sports, snowboarding was finally allowed in 1996. During the same year, Park City Ski Area was officially rebranded Park City Mountain Resort. The resort added its first high-speed 6-passenger chairlift. It was also around this time that the odd sibling rivalry between skiing and snowboarding emerged. In 1995, Salt Lake City was awarded the 2002 Olympic Games, and Park City was a major part of the city’s Olympic bid and hosting plan. In the end, Park City and its three major ski resorts hosted more than 40% of all the Olympic events. These Olympic Games was the fait accompli as Park City as a premier international destination for skiing and alpine sports. The first few years of the skiing industry in Park City were not the most lucrative but showed sufficient promise to continue the operation and development of the ski area. A major push was made in the late 60s and, despite some bumps along the road in the early 70s, the industry finally took hold. In 1974, Park City got a major boost when the US Ski Team relocated from Denver and additional major upgrades were made. The steady growth in popularity culminated in the third and last major skiing area, Deer Valley, opening at the beginning of the 1980s. 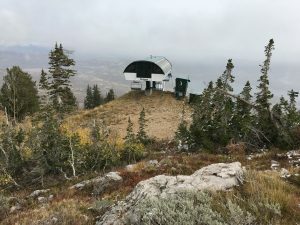 Treasure Mountains: In 1963, the Silver King Mining Company after two years of breakneck construction opened the Treasure Mountains Ski Area with the longest gondola in the world, a chairlift, base and summit lodges, and a J-bar. Soon, additional lifts and lodging were added, and the resort changed its name to Park City Ski Area. Some sources claim the name was changed as early as 1966, while others say the name wasn’t officially changed until 1971 when Edgar Stern bought the resort from Silver King Mining, before turning around and selling the resort himself in 1975. Park City West: This sister resort to Park City Ski Area was opened in 1968. It, too, changed hands and names several times. It was renamed ParkWest in 1975 and has also been known as Wolf Mountain, Canyons, and Canyons Village at Park City. Though this location has long played second fiddle to the swankier main resort area, this alpine area has always been among the biggest ski and snowboard areas in the state. Snow Park Ski Area: Though it was last to be developed into a major resort, this was one of the early ski areas for miners and their adolescent children. The first makeshift lifts were built at the Snow Park Ski Area from lodgepole pines as early as 1946. You could ski here on the weekend for a buck and a half and included a ski lesson. In 1981, Edgar Stern had made a comeback and was looking to get back into the ski industry. He bought this ski area, developed into a major ski resort, and named in Deer Valley. 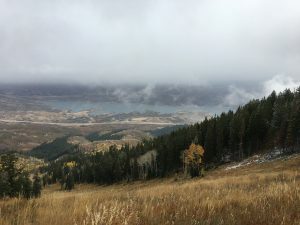 What’s the Deal with Park City’s Air Quality? If you’ve spent any time in Salt Lake City or the rest of Utah’s Wasatch Front, you’re probably familiar with the Salt Lake Valley’s natural inversion and struggle with air pollution. If your exposure to Utah has been mostly weekend and weeklong ski trips and you’ve been fortunate with your timing, you may not know what we’re talking about. That being said, what both local and visitors may or may not be aware of is Park City’s vulnerability to the poor air quality that comes with the Wasatch inversion. An inversion occurs when the normal pattern of thermal distribution is reversed—or inverted. 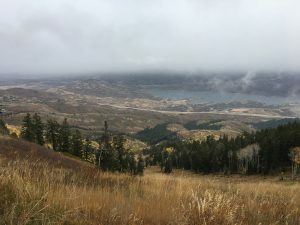 In other words, usually when you gain altitude—when you head from the Salt Lake Valley up Parley’s Canyon to Park City, it usually gets colder. This happens when a warm airmass settles over a cooler airmass. Typically, solar rays from the Sun are able to warm the land underneath the colder airmass and disrupt any would-be inversion. In the winter, however, these solar rays aren’t as strong, and if there’s snow cover on the ground, less of the Sun’s thermal energy is absorbed by the ground. An inversion is typically the result and, in some cases, will last until a low-pressure storm system knocks the warmer airmass out of the way. These inversions are a geological phenomenon and were remarked on by early pioneers who build their campfires and witness the smoke hit a ceiling and spread out horizontally against the sky. For it’s not the thermal inversion that’s the trouble in the end, it’s the trapped dome of air—especially when that dome is habitat to a million people, their cars and their industry. Because it’s less common for visible signs of air pollution to manifest in Park City—especially compared to the heavy fog that descend upon the Salt Lake Valley during the worst periods of inversion—it’s easy to think that Park City gets off virtually scot-free. The truth is….a little more polluted than that. Park City can experience its own less intense inversions. Plus, some of the air pollution for Salt Lake City does inevitably leak out and up Parley’s Canyon. And while there are only some 8,500 permanent residents, there are roughly 600,000 yearly visitors, most of them crammed into the few short months that are peak season for skiing—and for inversions. Now, we typically think of warming temperatures as the primary threat to our beloved ski town, but there’s also a secondary health concern associated with air pollution. While there are few immediate health concerns for the typically youthful skier, those with respiratory issues or those of advanced age or the very young may want to avoid the physical exertion that comes with being on the mountain when the air quality isn’t cooperating. But it’s also no secret that this type of health recommendation is an issue for the ski resorts who are trying to market reliable access to great skiing. That way, they can attract more out-of-town visitors who need to plan their trip in advance of the short-term weather forecast. Though unsubstantiated, we’ve heard that the ski resorts may be pressuring county and state officials to prevent this information from being readily available to the public. Though problematic in their own right, you may still be able to find certain types of air quality information private weather companies and their websites. This follows the same pattern as January, which languished in relatively dry and unseasonably warm temperatures until January 20th brought about a foot of snow—rescuing what had been fully deployed snowmaking infrastructure. It’s the temperatures in Park City that are likely to have the biggest part in the story. The mountains seemed to shed the foot of snow with frightening ease at the end of January and early February. If we can borrow from the cold snap that’s blanketed much of the eastern United States this year, we might finally have a legit ski season on our poles. Much of the area is hankering to make up for lost time, as most of 2017 was a lost cause for skiing in Park City. And while the average monthly snowfall in Park City doesn’t skew as heavily toward March and April as it does in Colorado, it’s not uncommon for late winter and early spring to see a disproportional amount of the total season’s snowfall amounts. As bad as the first half of the ski season has been, that doesn’t mean the second half can’t be awesome! On the other hand, just because the end of February has been great for skiing doesn’t mean March is going to be an alpine paradise. It’s not all bad. For one thing, as that same news story points out, people are noticing and recognizing the danger. Plus, warming temperatures should also hold more moisture, mitigating some of the effects. Supposedly. The resorts keep getting better and better at making their own snow. Everything feels almost like it’s in its heyday, where as long as the next snowfall is coming, you can pretend everything is going to be good forever.